Belfast Giants dropped five points off the pace in the Elite League after losing 3-2 at home against leaders Nottingham Panthers on Saturday. 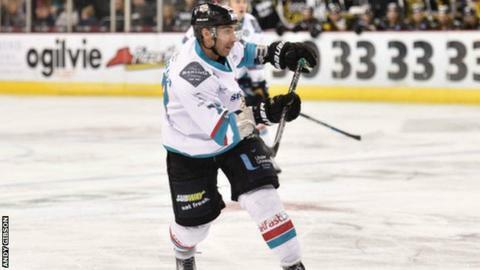 Nottingham's victory avenged their 4-3 defeat by Belfast at the SSE Arena on Friday night. Goals from James Desmarais and Chris Higgins saw the Giants levelling on two occasions after strikes by Nottingham's Steven Lee and Jeff Dimmen. However, Juraj Kolnik hit Nottingham's winner midway through the final period. Lee notched the only goal of the opening period and while Desmarais equalised five minutes into the second period, Dimmen restored Nottingham's lead five minutes later. Higgins got Belfast on terms again five minutes and 26 seconds into the final period but Kolnik struck Nottingham's winner six minutes later. The Giants remain third in the table but they are now four points behind second-placed Cardiff Devils after the Welsh outfit defeated Braehead Clan 1-0 on Saturday night.